After clearing a major legal hurdle with the Supreme Court three years ago, the Affordable Care Act faces another high court battle this week that could deal a major blow to the law. This time, the question is whether four words – “established by the state” – are enough to invalidate a vital part of the health care law. About five years after President Barack Obama’s signature health care law passed, more than 11 million Americans have signed up for health insurance through the program. And public opinion has remained steady: A greater share disapproves (53%) than approves (45%) of the ACA, also known as Obamacare, according to a Pew Research Center survey conducted Feb. 18-22. As was the case even before the original bill came up for a vote in Congress, public opinion regarding the program continues to fall along party lines, with nearly nine-in-ten Republicans (87%) against the 2010 health care law and roughly eight-in-ten Democrats (78%) in support of it. Independents disapprove of the ACA by a margin of 58%-39%. 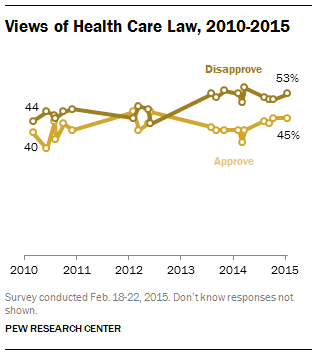 Recently, Americans said they had been starting to see the effects of the health care law in action. Those who said it has had a negative effect on the country overall outnumbered those who said it has been positive by 45% to 33%, according to a September survey. Just 18% said the law hadn’t had much of an effect on the country. When it came to the law’s effect on people personally, however, most Americans (54%) said the health care law had not had an effect on them or their family up until that point. About one-in-four Americans (26%) said the impact of the law on them personally had been negative, compared with 19% who said it had been positive. This week’s Supreme Court case, King v. Burwell, will decide whether the federal government can subsidize health insurance for some lower- and middle-income people living in states that chose not to establish their own exchanges. Some predict that the entire health care law will be on “life support” if the court invalidates the federal subsidies. Thirty-four states’ exchanges would be upended and more than 6 million would lose the subsidies that help them afford their health insurance. The Supreme Court’s decision in the case could impact how the public views the institution. Americans’ views of the high court are near their lowest point in at least the past few decades. As the court has handed down decisions on highly politicized cases in recent years, it has seen ebbs and flows in support from Democrats and Republicans. For example, after the Supreme Court ruled to keep intact much of the health care law in summer 2012, 64% of Democrats said they viewed the court favorably, compared with just 38% of Republicans. But after the court’s session last June, which included a conservative victory on contraception in the Hobby Lobby case, the court’s favorability rose to 53% among Republicans and fell to 52% among Democrats. 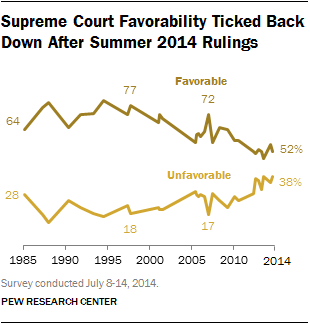 Overall, we found in that survey last July, about half of the public (52%) had a favorable opinion of the Supreme Court and 38% viewed it unfavorably. The public remains just as divided about the ideology of the nine-member group as two years ago. About as many say the court is liberal (26%) as conservative (27%), while a 38% plurality calls it “middle of the road,” relatively unchanged from 2012. 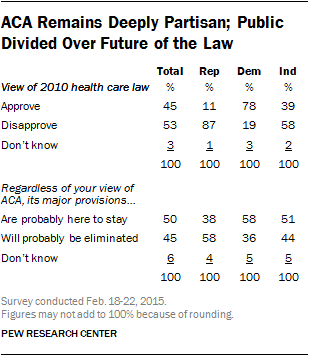 Republicans and Democrats are split regarding the law’s fate. About six-in-ten Republicans (58%) expect the law’s major provisions to be eliminated, but 38% don’t; an identical 58% of Democrats think the important parts are here to stay, but 36% predict they will be eliminated. Seth Motel is a former research analyst focusing on U.S. politics and policy at Pew Research Center.